Pet odour removal by Chem-Dry Professionals. Problems travel far and wide! 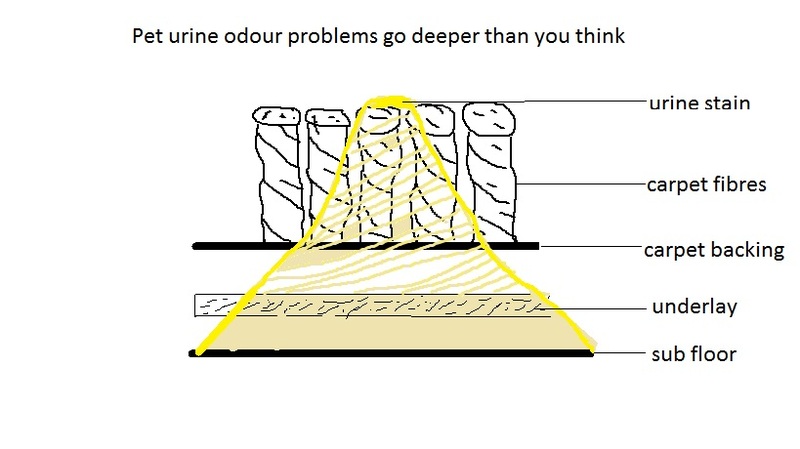 Pet odour removal is one of the major cleaning challenges for Chem-Dry. When a cat or dog has an accident on the carpet, this can cause quite a stir in the family home. Our pet odour treatments are designed to fix the problem. ChemDry QuickDry will arrange a free inspection to evaluate the extent of the problem and discuss remedial action on each individual basis. In our experience customers often underestimate the problem considerably. Pet deposits mean a large increase of indoor bacterial contamination. Therefore it is imperative that all affected areas are identified, cleaned and disinfected. It goes without saying that this issue becomes even more pressing when small children or babies are present in the home. What does the pet odour removal service entail? Treatment of the affected area with a carpet grade disinfectant. Treatment of carpet, underlay and floor with our PURT system of cleaning. Our enzyme based product will neutralize the odour causing bacteria. We are able to remove and replace underlay and refit carpets where the problem is severe. If the pet odour removal service is required for your rugs, our rug immersion service provides another option. We take the rugs away to our dedicated rug cleaning facility where the problem is resolved. Just another brilliant Chem-Dry service! Pet owners – do not delay – we are here to help!